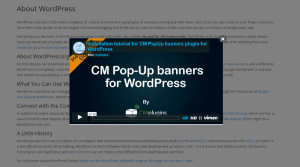 Our WordPress popup plugin helps you add responsive popup banners to your site with custom messages and effects. 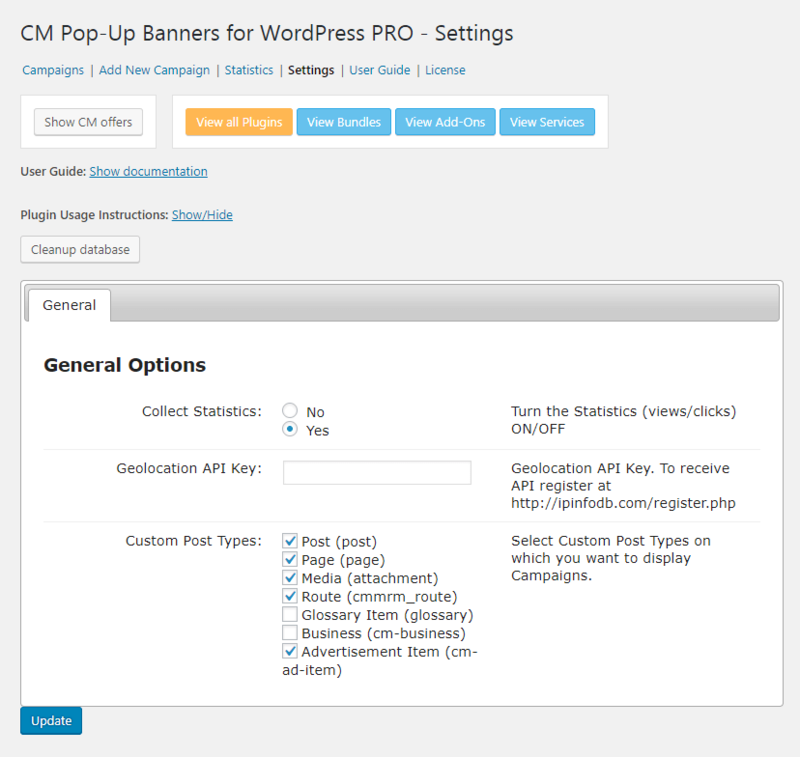 Get Pop-Up Banners Pro and 6 other essential WordPress marketing plugins for 50% less! 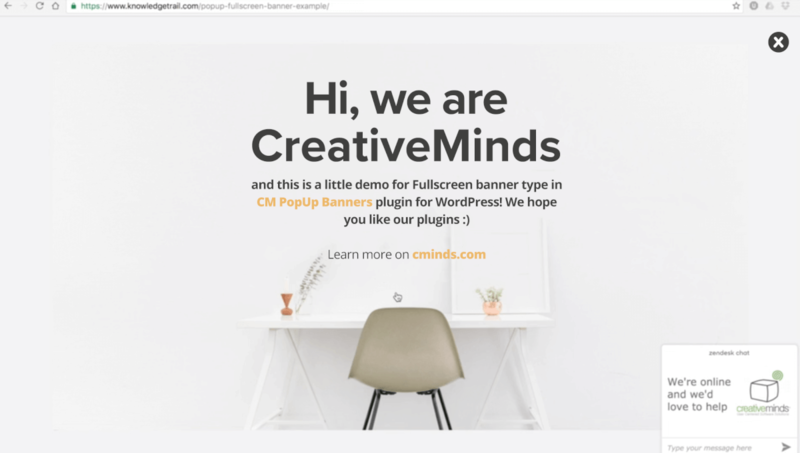 The WordPress PopUps plugin by CreativeMinds allows you to add various banner ads and announcements for any page of your site. 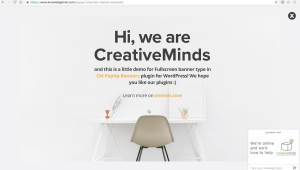 This popover WordPress plugin makes it easy to create fixed custom banners that appear in the middle or bottom of your page. 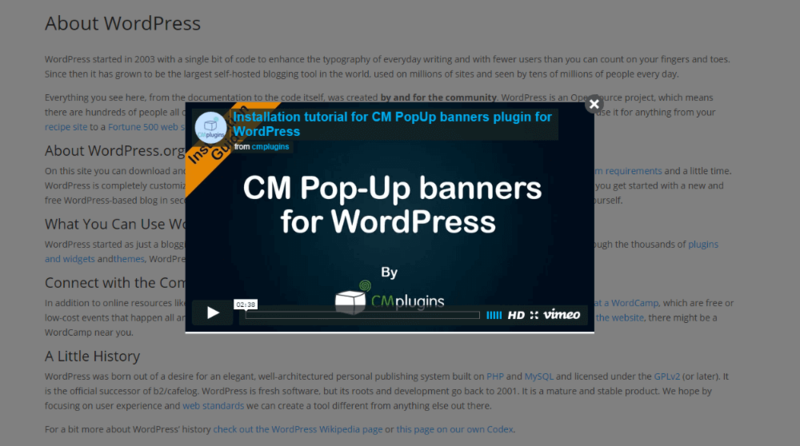 The WordPress popup builder plugin includes various popup components and features for creating versatile popups and highly converting popups that boost email lists and events for your WordPress site. 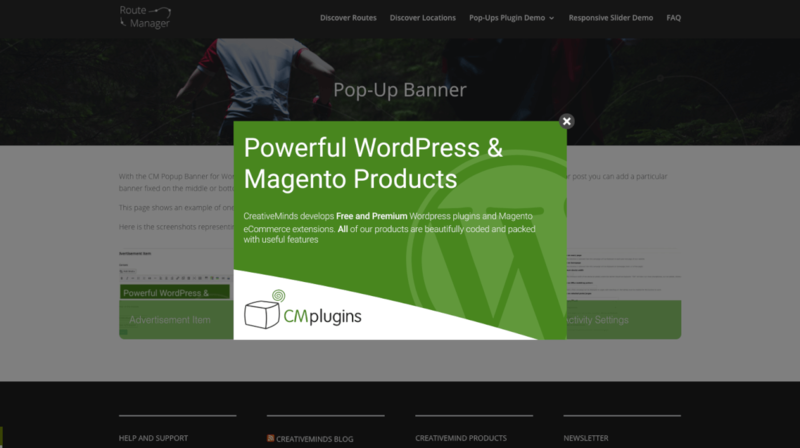 The Custom Popup Banners plugin includes image popups, shortcode popups, text popups, popup animations, video popups and more, as well as the ability to create multiple popups for various posts and pages. Are you promoting a new event, product or discount? This responsive popover WordPress plugin is an excellent lead generation tool. Design a custom popup banner ad that will grab the user’s attention without interrupting their browsing! 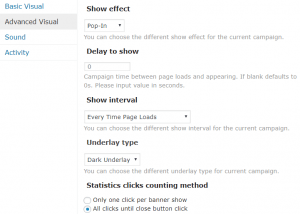 When using this plugin each popup runs inside its own campaign allowing you to control the popup location in your site, dates in which it will appear, time during the day and much more! 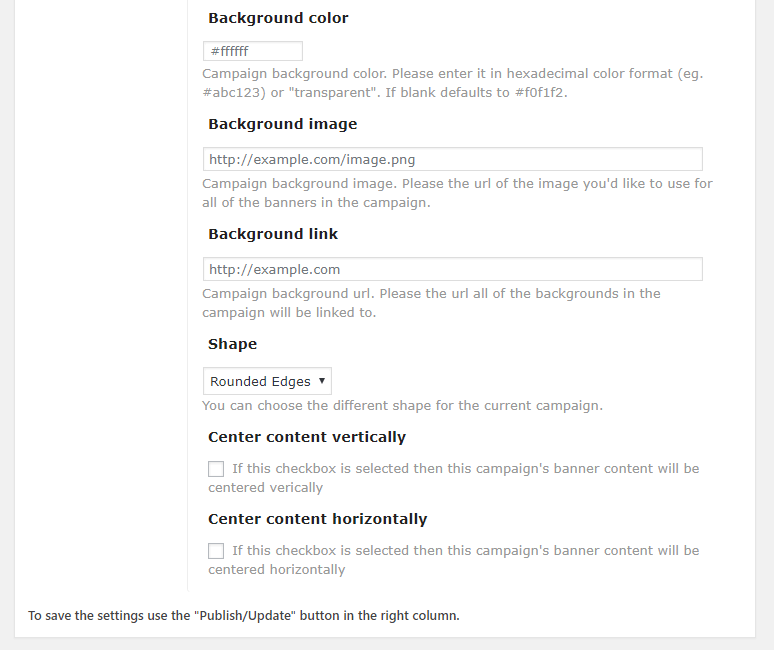 You can also trigger the popup to appear when the user hovers over an image or when they clicks an image. 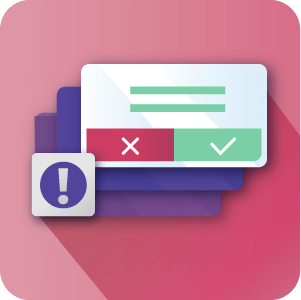 Popup Types – This popup system allows you to choose between pop-up, fly-in and full-screen banner options. 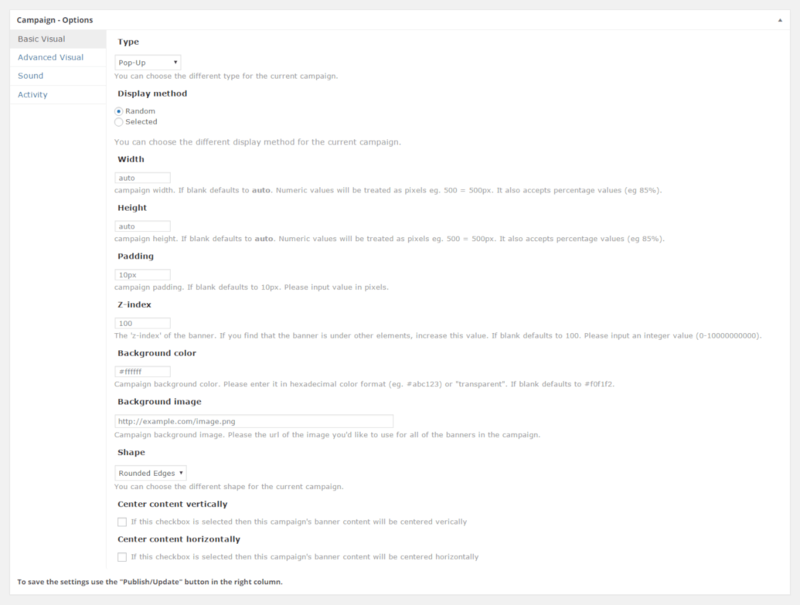 You can define multiple campaigns to work on your website. 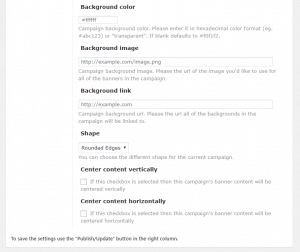 PopUp Width and Height – Choose the width/height of the custom WordPress popup windows. Responsive – Fully responsive with option to turn mobile display off. AdDesigner – Easily create a custom banner and add the required text and colors. 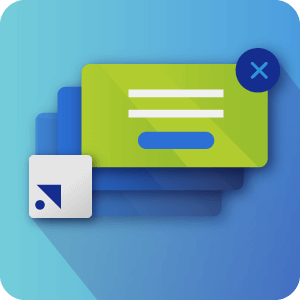 The Ad Designer is an easy to use tool that helps you build beautiful popups and manage the awesome popup designs . 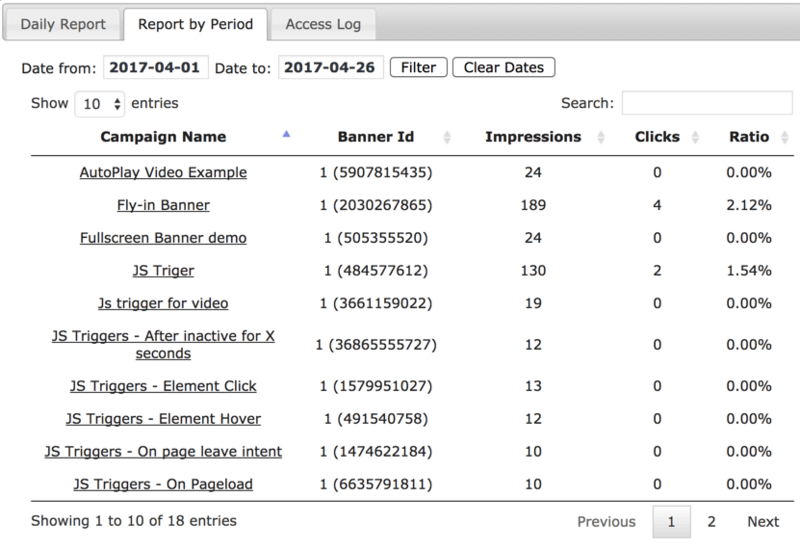 Campaign Statistics – Track banner clicks and impressions in an easy-to-use report. 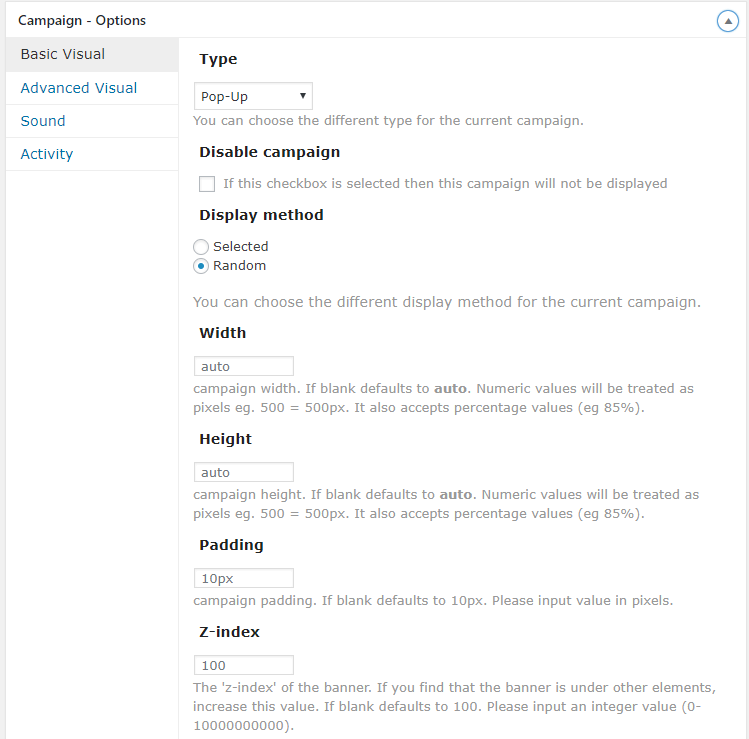 If you use banner variations in a campaign you can check when the banner converts more. 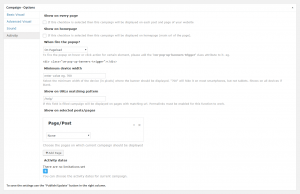 Restrict by Page/Post/URL – Choose which pages, posts, or specific URL your campaign will appear on. 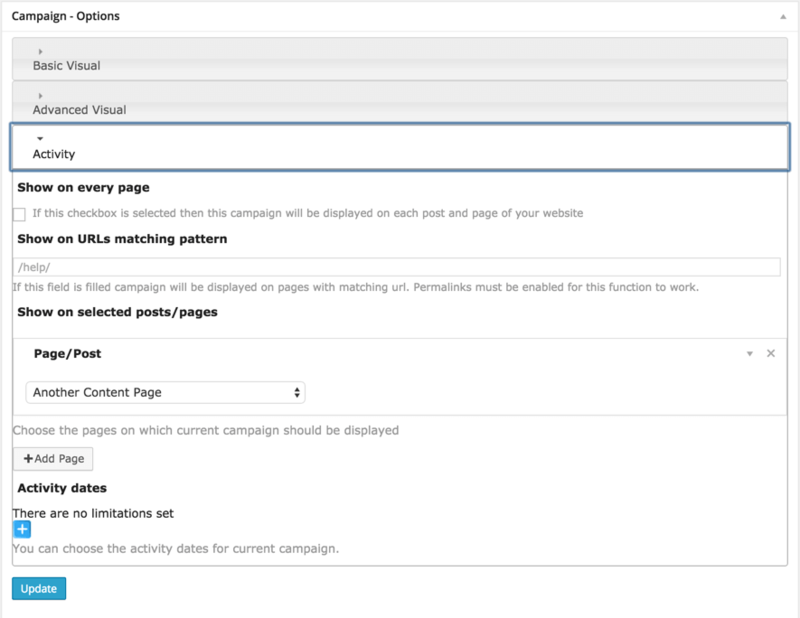 You can choose multiple pages for each campaign. 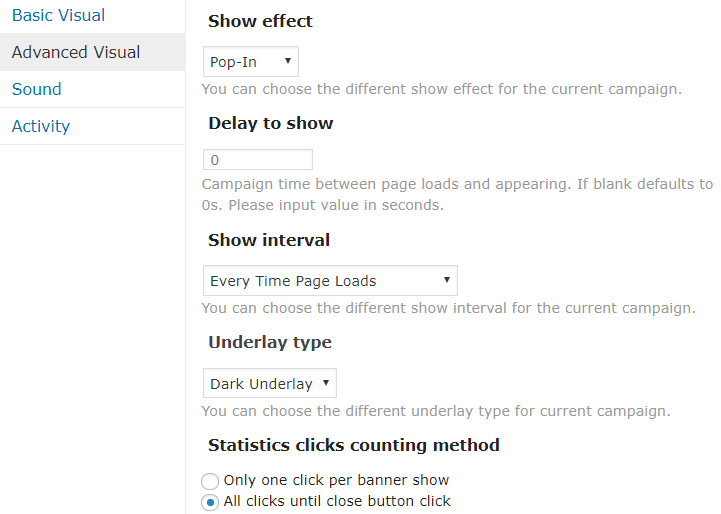 Restrict by Period – Choose the start and end date and time for your popup ad campaign. 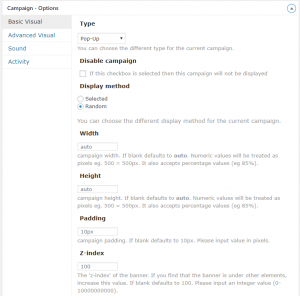 Random PopUps – Add multiple popup banners in the same campaign and show a random popup allowing you to choose the best converting popup. Custom Effects – Define PopUp banner campaign effects once popup shows. For example, you can make the popup slide before appearing. 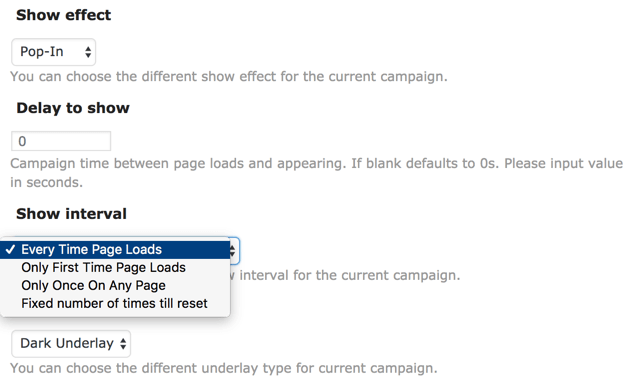 Option to add delay – Add a delay between the time that the page loads and the popup appear. Display Interval – Define when user will see the popup. On every page load, one per each page and more. PopUp Content – Use image popups, html banners, video and more. 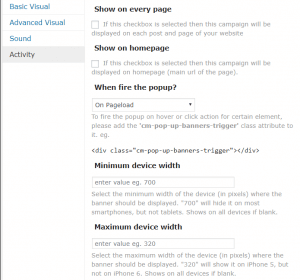 Special Triggers – Trigger popup or fly-in on JS hover or click events. Sounds – Support for a sound file to be played once popup appears. User can upload their own sound files or use plugin default. 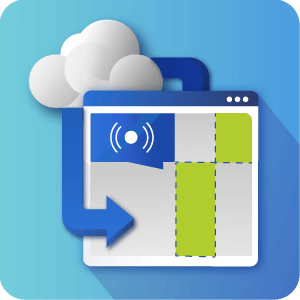 Fullscreen Popup – Support a full screen popup window. Page leave intent detection Popup – Detect when user moves cursor to close the tab and in such event show the popup. Inactivity detection – You can show the popup when user’s inactive for X seconds (not moving mouse and not typing). Show X amount of times per customer – You can define that the campaign will show X amount of time per a specific customer until it stops. 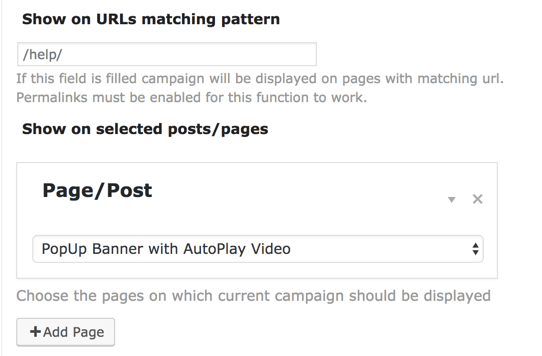 Target Specific Users – Set campaign to target logged-in or non logged-in users. 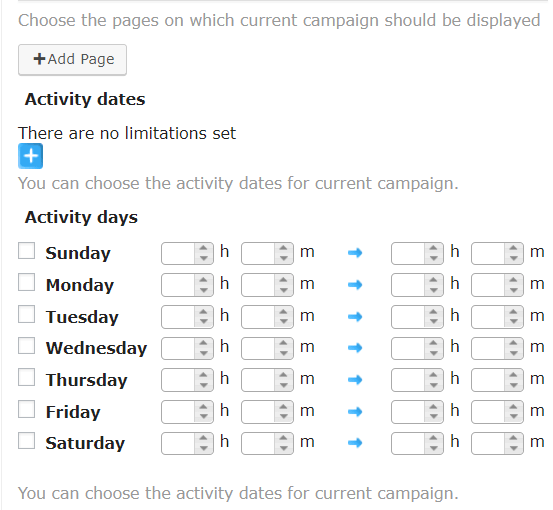 Restrict by days of the week – You can define that the campaign will run on specific days of the week. 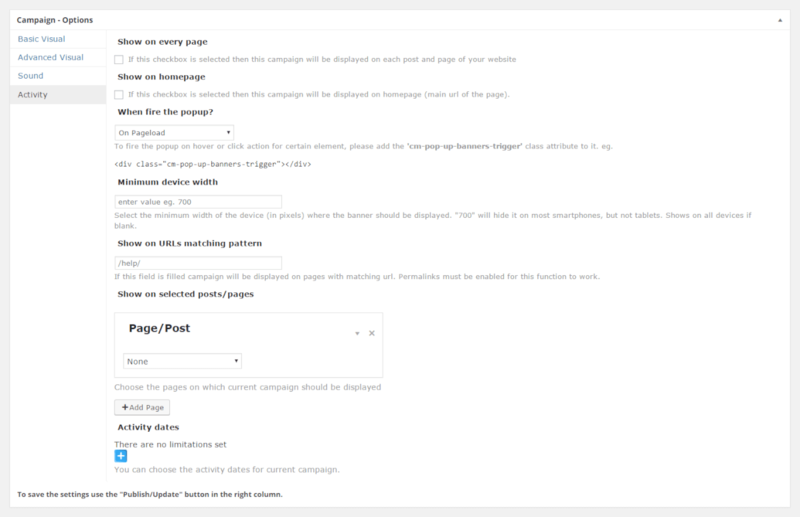 To see the major features of the Popup Campaign Manager Plugin, check out the clips below or visit our demo site. Can I customize popup to match my site? Yes. 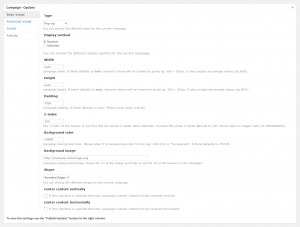 The plugin is not theme specific and supports all major themes. 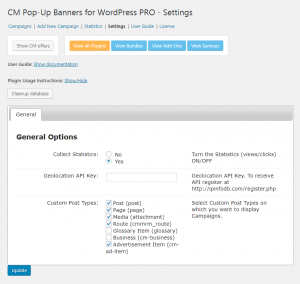 The plugin includes many customization options available per each banner campaign. Can I use a HTML banner? Yes. 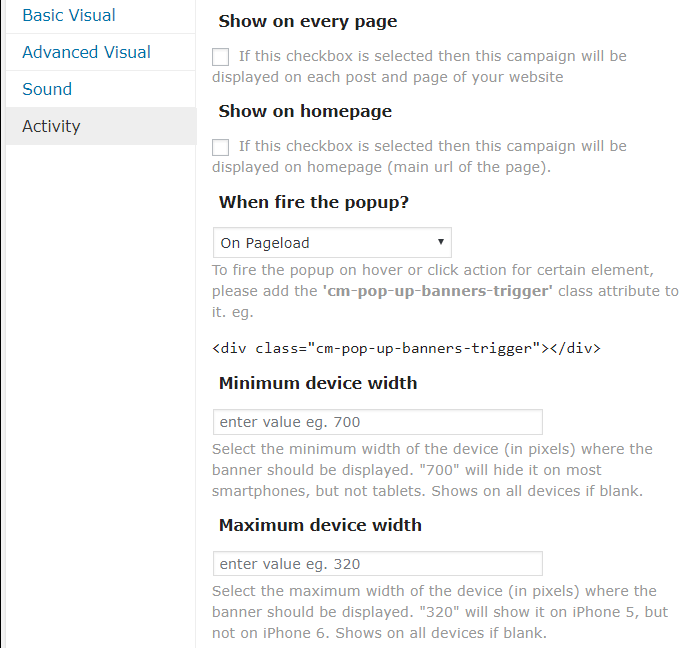 The plugin supports the display of HTML in the popup banners. To learn more about how this works see our documentation article with a tutorial video by ☞ clicking here . 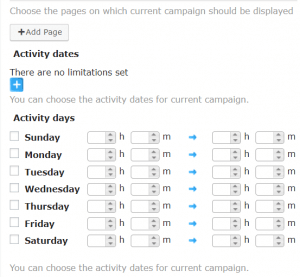 Can I limit my campaigns to appear on specific dates? Yes. In fact, you can specify not only the dates in which you want your banners to appear, but also the days in the week and times of the day. Can I create banner ads for specific pages? Sure you can! 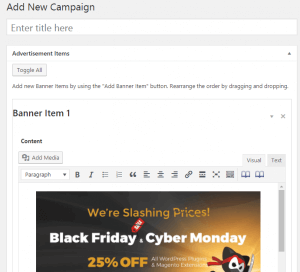 Each of the banner ads you create, can either be assigned to all pages and posts, for specific post types, or for specified url’s within your site. 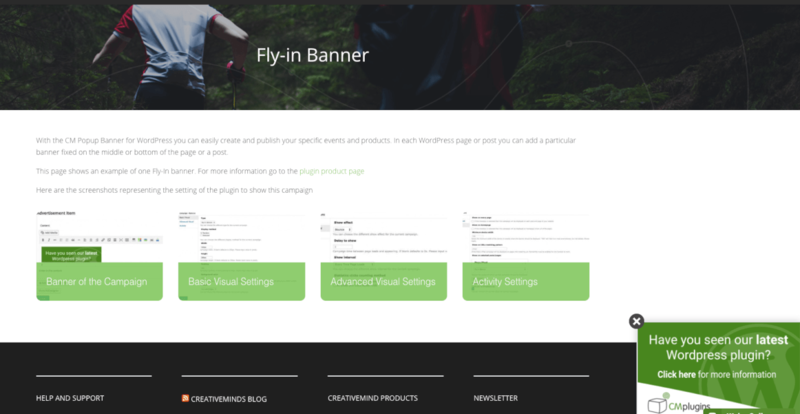 You can also determine whether to display the banners each time a page loads, or only on the first page load. Do I have to use pre-made images for my pop-up campaign? Absolutely not! Pre-made images look great on pop-up campaigns, but they’re not obligatory. If you don’t have a graphic designer to create your banners, you can easily build them yourself using our html popup banner editor. 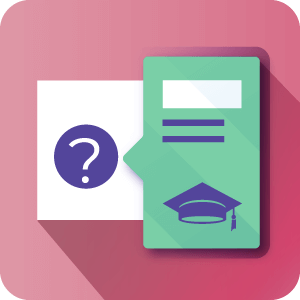 You can customize the text, font, size, color, border and opacity of your banners, and much much more. Does this plugin have age restriction popup option? Unfortunately, this plugin does not have age restriction popup . Does this plugin allow to add a disclaimer popup notice ? Welcome Message and Disclaimer Plugin for WordPress allows you to add disclaimer popup notice . Is it possible to add audio or any other media into pop-up banners? 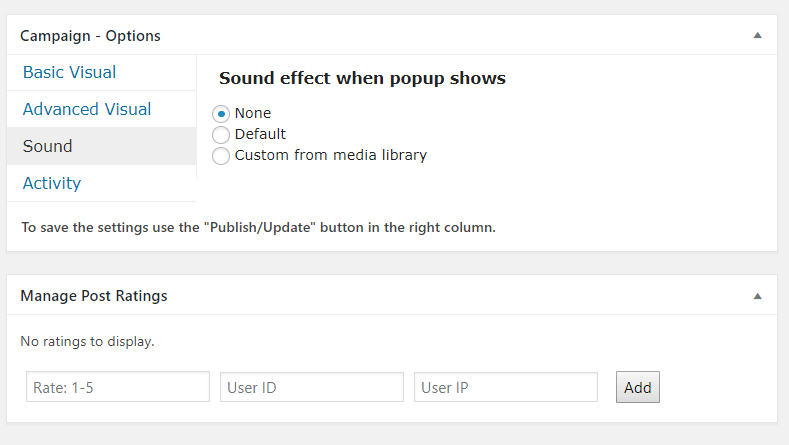 Yes, our plugin supports adding Audio as well as Video to the pop-up banners. There is a user guide for both of these. Check them out: Audio Popup… Video Popup. I am working on a client’s website and about 2 weeks ago, it was imperative that I get a suitable pop up plugin for a reasonable price and fast.I chose this plugin and everything was great. 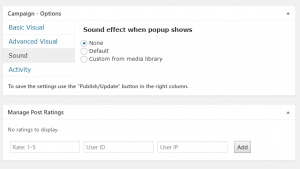 Unlike other free pop up plugins, this one gives you far more customization options. The only thing was that I needed it to only show on the front page and the only options were for it to show on all pages.I contacted the developers about my issue and within a days time, they resolved the issue!Great plugin and even better support, thank you! Works really well. I’m a designer and I like the pro options alot. I can brand the plugin however I need it. I was able to set it up and get it to work, but had some minor issues and the support service was excellent. Very impressed. Works well and does what it should. good work! 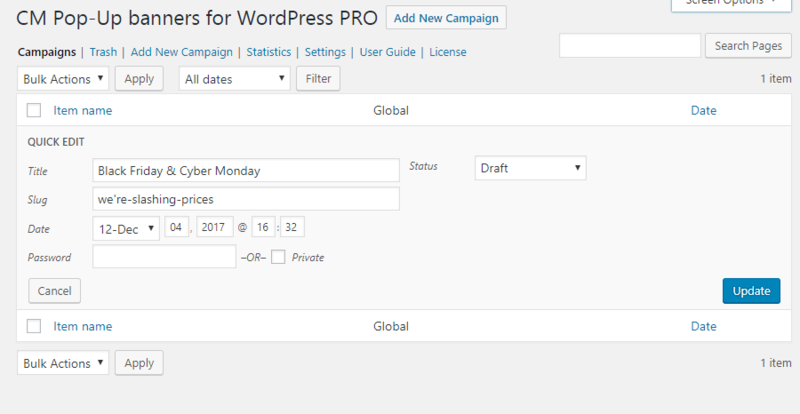 I have tried using the Popup banner plugin and it worked well with my theme and didn’t conflict with any other plugin on my WordPress site. I had an issue while trying to show the popup on my homepage and contacted support which promised to fix the issue and release a new version.